No. 29, Jalan 3/108C, Taman Sungai Besi, 57100 Kuala Lumpur, Malaysia. 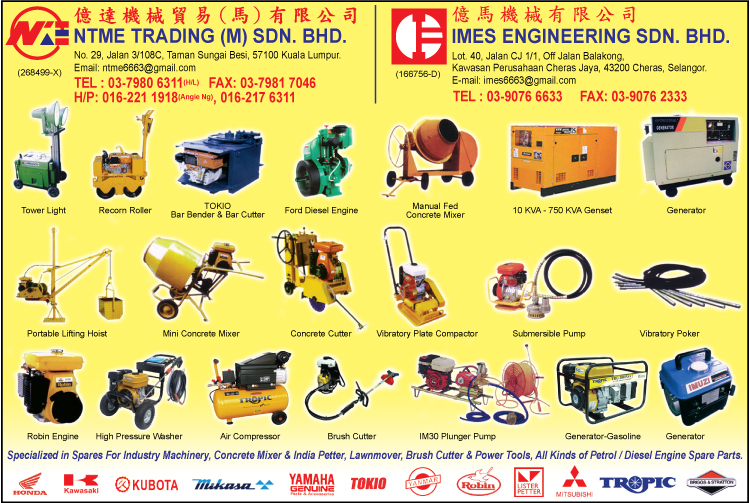 With over 17 years of experience, Imes Engineering Sdn Bhd offers the most complete range of light construction & industrial equipment, agricultural equipment, gasoline & diesel generator sets, machinery parts and gasoline & diesel engine in the market. We carry major brand names for more flexible choices, keeping pace with customers' strict requirement. We are equipped to share with you basic information and product capabilities on your order. As a smaller and tightly focused firm in Taman Sungai Besi, Selangor Darul Ehsan, we can interact closely with our customers. Imes Engineering is dedicated to provide the finest in machine quality to our customers. 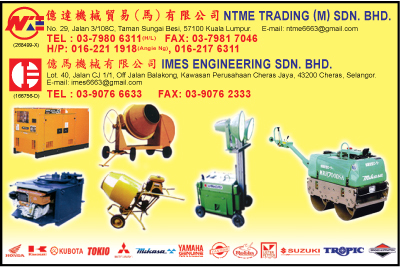 Imes Engineering has always persisted in good quality products, earnest service and affordable price offer for customers. Today, we are looking forward to our honourable customers to keep support us, while we are commited to provide you with only premium quality products and excellent service to guarantee you an upmost satisfaction.